Hello darlings! 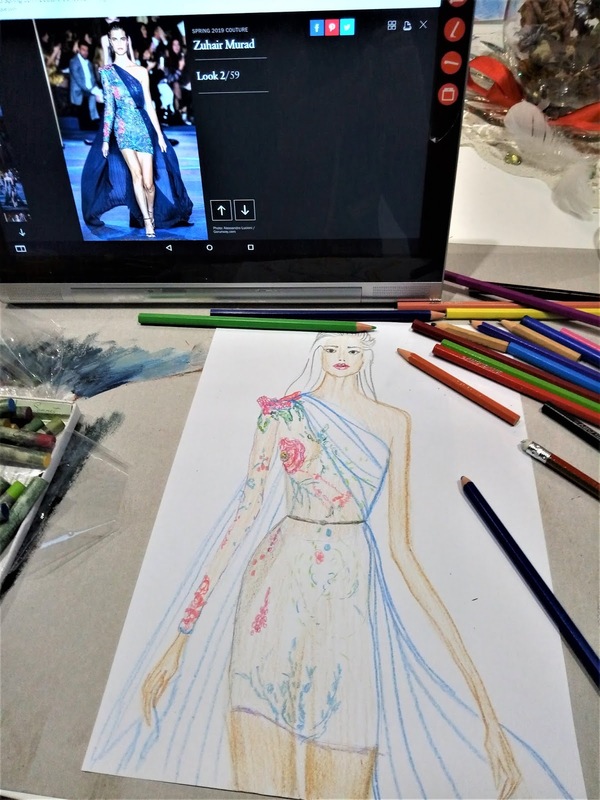 I'm back with another fashion illustration from Paris fashion week. I'm quite proud of this one. 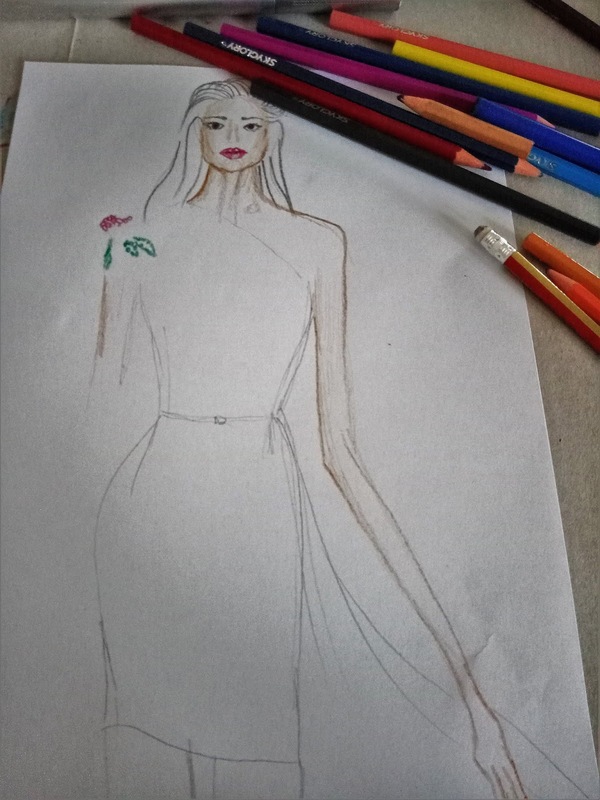 When I started this fashion illustration, I almost gave up half way because there are so many details on this dress, but now I'm glad I didn't. The medium for this illustration is coloured pencil on regular printing paper. 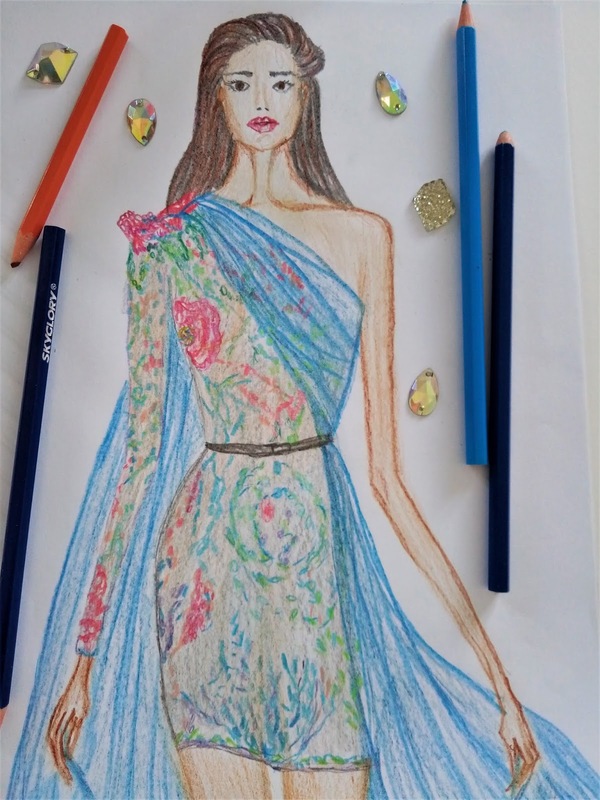 Just like the last dress I illustrated, this one is from Murad Zuhair 2019 Couture collection. Couture dresses are often long, but with this one Zuhair Murad definitely proved that this doesn't have to be the case. A dress can have the elegance typically associated with haute couture even if it is quite short. It all depends on the material, design and the craftsmanship. I'd say this beautiful dress has all it needs. It was the second look in the show, but it is perhaps my favourite one. This embroidered transparent mini dress is belted at waist and completed with a long blue sheer scarf that creates a feeling of a cape. Absolutely gorgeous design! I think I'm in love with this collection as a whole, but this dress most of all. What do you think? 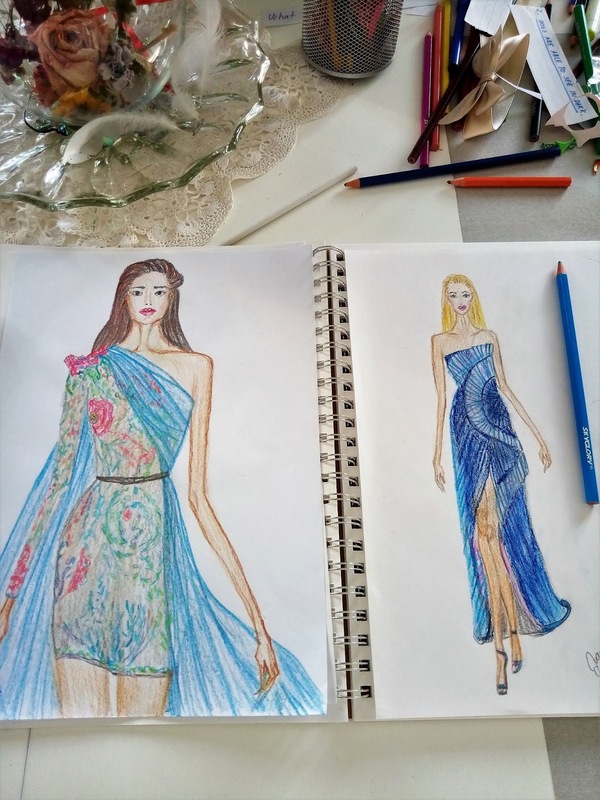 Since I have already illustrated two dresses from this collection, should I keep going? 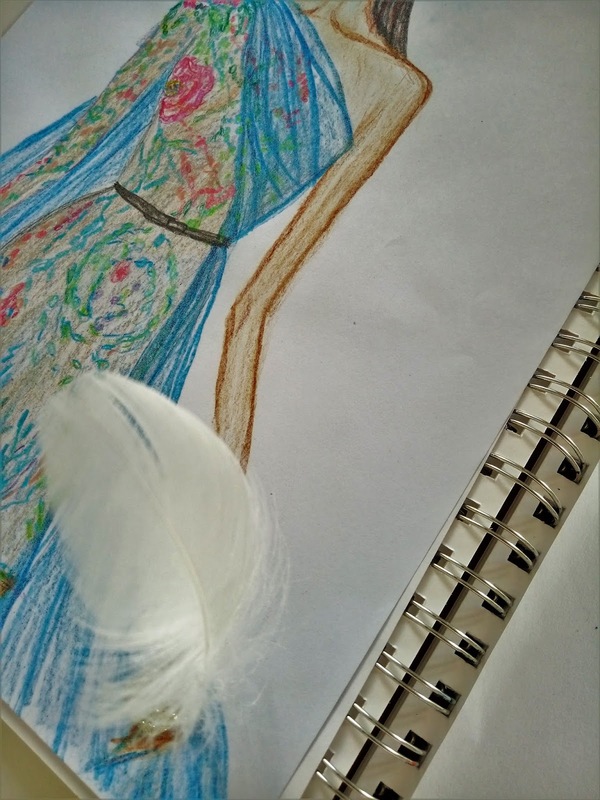 I know that a lot of you enjoy step by step photographs of my fashion drawings, so I included some of those. 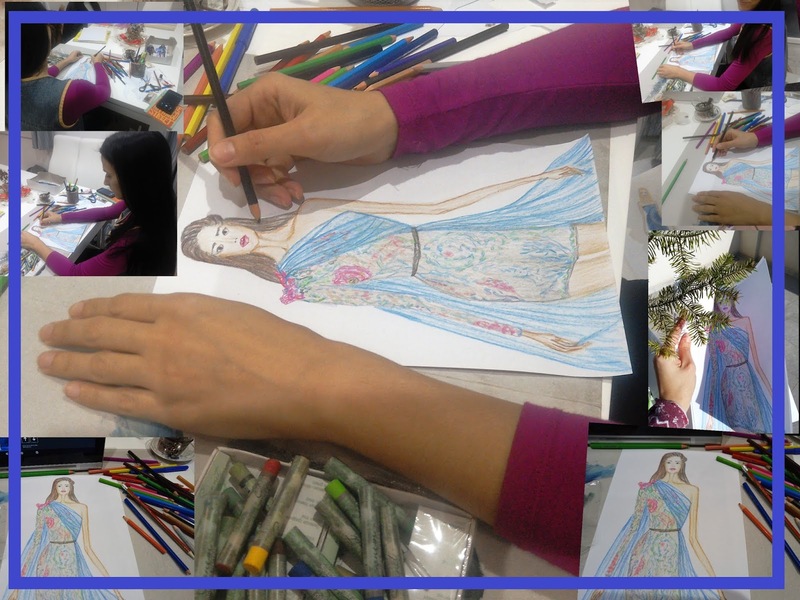 The first step for this fashion illustration was to create the outline of the body and the dress. The second one was to define the outline. Thirdly, I started to fill in the body and the face, and added some of the details. 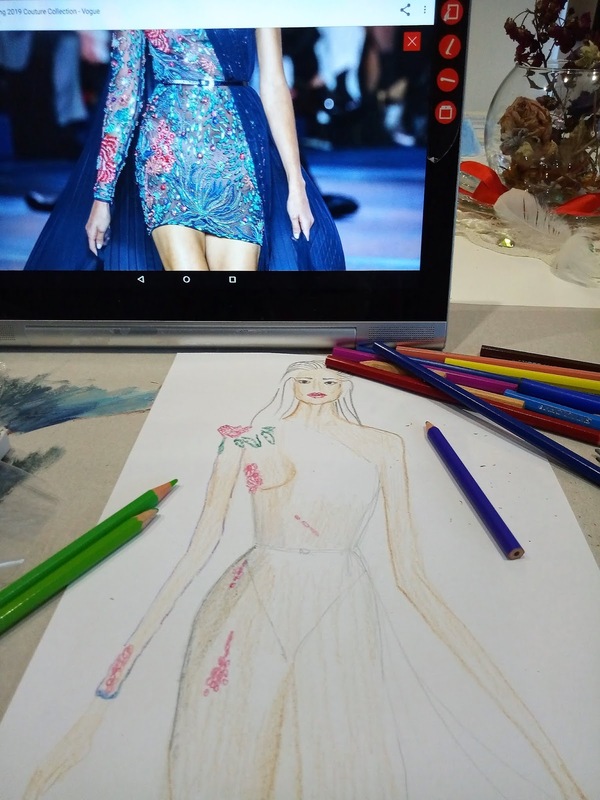 Now, because this dress is transparent, I coloured the whole body and only then I preceded to drawing the remaining embroidery and colouring the dress. Fourthly, I added the finishing touches. Half way there, I wanted to give up because it seemed like too much work, but I kept going anyway, and finally I ended up with an illustration I quite like. This proves you should never give up on doing something you like, even if you get tired in the process. 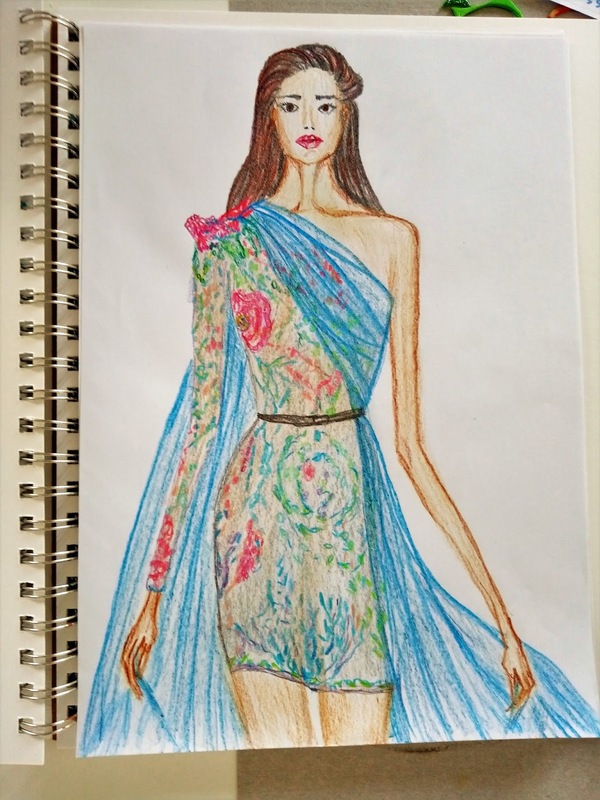 I didn't time myself, so I'm not sure how long it took me to finish this fashion drawing, but it must have been longer than an hour, maybe even more. There are a lot of details on this one. Anyhow, if you want to see my work in progress photography, be my guest and scroll down. That would be all for today. I'm keeping today's post short and simple. 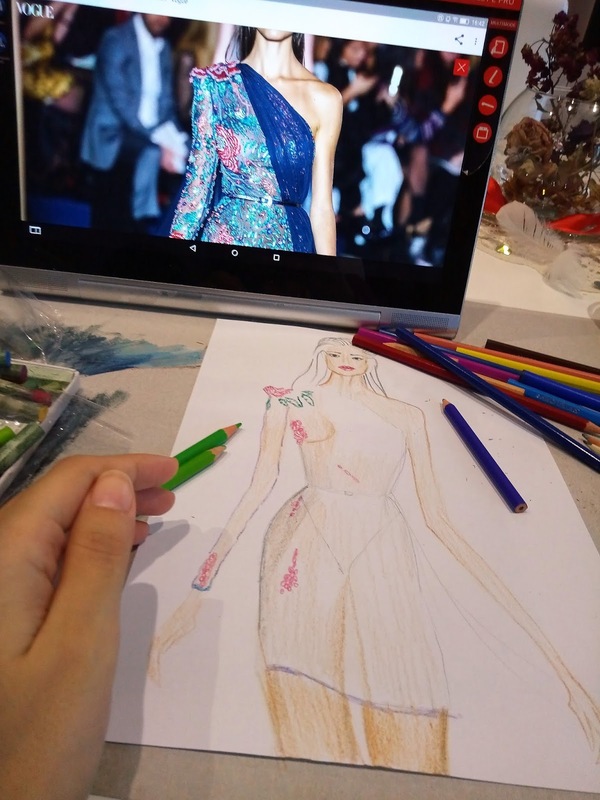 It's all about this fashion illustration. Do tell me what you think about it? 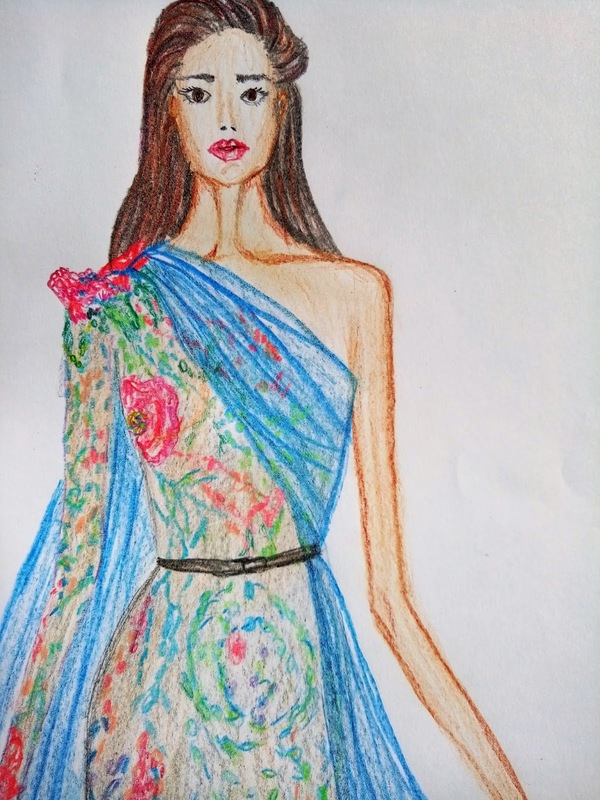 Do you like this style of fashion illustrating? What about the dress itself, do you like it? 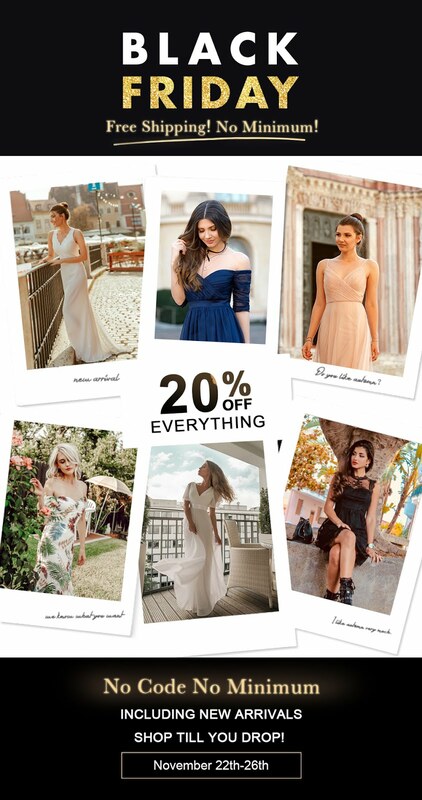 Have you seen this collection? What was your favourite collection at Paris Fashion Week? What is the fashion week you're still looking forward to? I know, a lot of questions. Would you love to own this dress? It's true, dearest Ivana - this dress has all it needs! It's beautiful - it's WOW, and your illustration is, too! It's really good that you didn't give up! So pretty, I love all the colours you illustrated so beautifully! I'm so glad you didn't give up on this one, Ivana. It's absolutely incredible both in your illustration and in the photo!! I could see myself wearing this with pride!! Oh wow I'm glad you didn't give up and you kept sketching this one, it's beautiful! 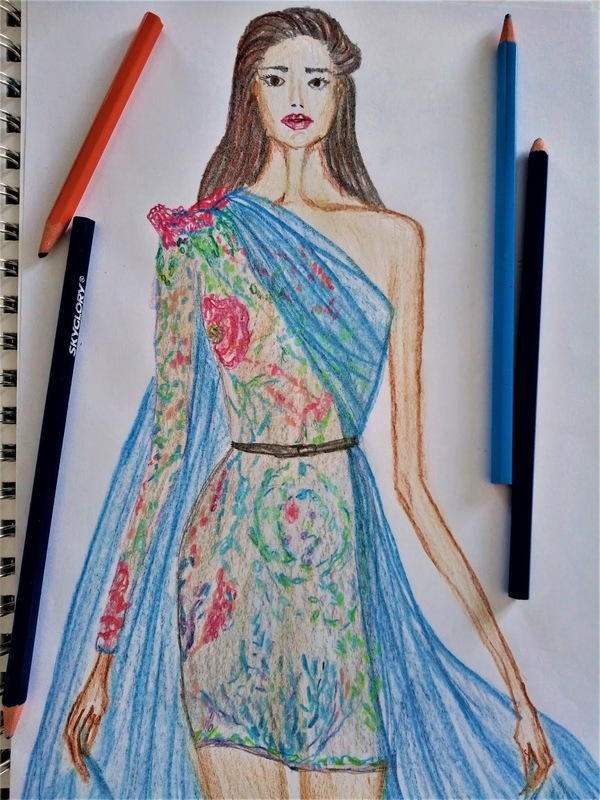 I really like the dress itself and I think you captured it well on paper - what a stunning piece! 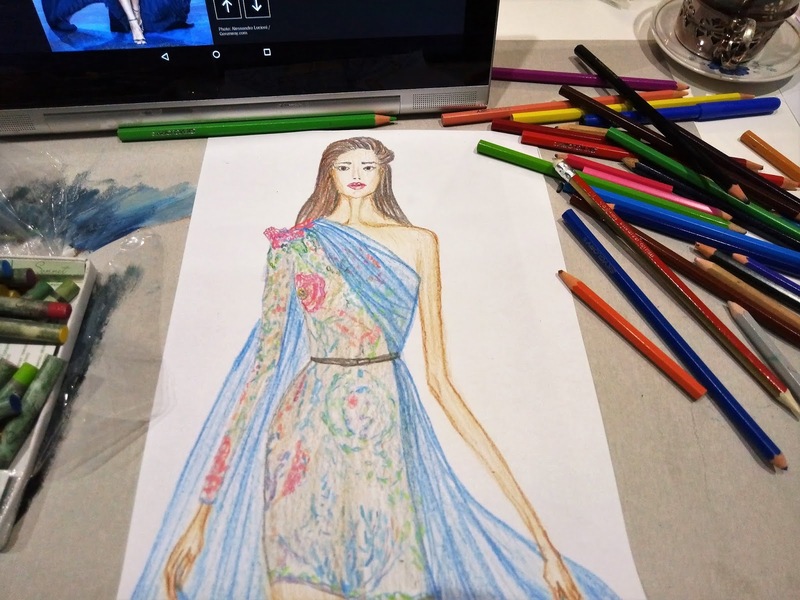 That dress truly is beautiful and your illustration of it looks great. It was really interesting to see a step-by-step of how you drew it. It's good that you didn't give up because the result is definitely worth the effort. Thank you dear, I loved the blue draping as well, it really added something. Che abito! Che dettagli! Che splendore! Per me è amore a prima vista! The dress itself is beautiful and you captured it beautifully! Your illustrations are amazing hun! Devo dire che lo hai replicato benissimo, talmente tanto che sembra di vederlo davvero, bellissimi i colori!